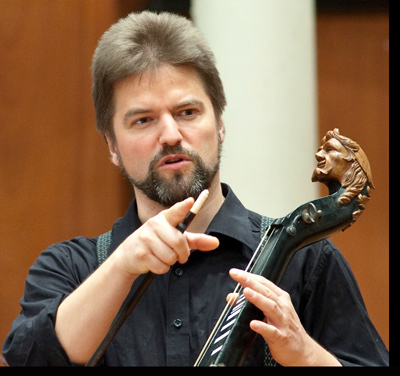 Thilo Hirsch is a graduate of the Schola Cantorum Basiliensis, where he studied viola da gamba with Christophe Coin (diploma 1995, dissertation: The "cantar alla viola" in the 16. century) and singing with R. Levitt and Kurt Widmer. He has been engaged by numerous international ensembles for concerts, CD and radio recordings. His concert tours have already taken him across all of Europe to North Africa, North and South America and Japan. Since 1991 he has been the artistic director of the ensemble arcimboldo, with which he has given numerous concerts and made radio and CD recordings. In 1996, Thilo Hirsch founded the theatre ensemble TEATRO ARCIMBOLDO, whose invitations to many festivals and whose enthusiastic reviews are a testament to its success. ‘A sensual treat, delightful music theatre’ (Basler Zeitung), ‘fascinating dance theatre’ (Schwetzinger Zeitung), ‘A spectacle for all the senses of a thrilling quality’ (Fränkischer Tag), ‘An evening that set new standards’ (Thüringer Allgemeine) and ‘a choice jewel that was acknowledged by the audience with long, stormy applause’ (Schwetzinger Woche). Thilo Hirsch’s interest in rare string instruments led him to research the playing of the trumpet marine. He is now one of the few experts on this extraordinary instrument that was much played during the Baroque period. From 2007 to 2013 he was the co-director of a project of the Swiss National Science Foundation run at the Schola Cantorum Basiliensis, with the topic: ‘The Grande Écurie – research and reconstruction of its instruments and its repertoire at the court of Louis XIV and Louis XV’ and a BBT/SNF project (2011–2015) with the topic: ‘‘Transformations of Instrumental Sonority exemplified by the Italian Viol’. (Further information is to be found in the internet research database of the Schola Cantorum Basilienis: www.rimab.ch) The "audible" results of these research projects were documented in concerts as well as on CDs recorded by ensemble arcimboldo. Since 2015, Thilo Hirsch has been working on the evidence-based reconstruction of the vihuela de arco, a Spanish Renaissance Instrument, and its playing technique.